You may know Chinese food; you may even love it. But The Last Chinese Chef will take you into a world of Chinese food you never even knew existed. Here is the hidden universe of one of the world’s great cuisines. Its philosophy, its concepts, and its artistic ambitions are all illuminated in a story that’s entertaining, emotionally satisfying, and erudite. 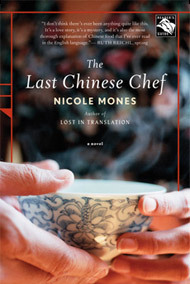 When widowed American food writer Maggie McElroy is hit by a paternity claim against her husband’s estate, she has to go to China immediately. She asks her magazine for time off. They counter with an assignment: to profile rising culinary star Sam Liang. In China Maggie teases apart the knots of her husband’s past, finding out more than she expected about him and about herself. With Sam as her guide, she also journeys deep into a food culture rooted in its own principles and traditions. She is transformed – by the cuisine, by Sam’s family, a querulous but loving pack of passionate cooks and diners, and most of all by Sam himself. She begins to feel her soul coming back. A masterpiece for Chinese food.